The transportation of goods is the lifeblood of modern economies, connecting suppliers with customers and producers with consumers.At Manline, we understand how important it is for your load to arrive safely, when and where you need it. Our smart transport solutions are designed specifically to work for your business. In fact, customising transport solutions around your business needs is what we do best. We have the experience, the resources, the technology and the expertise to transport your cargo safely across the country and beyond into sub-Saharan Africa. 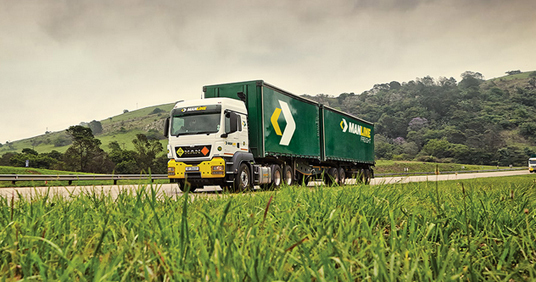 Manline is a diversified transport group providing smart transport solutions throughout Southern Africa. The group was founded in 1998 with a fleet of just five trucks. Today we own and operate over 400 vehicles from 8 depots in sub-Saharan Africa. Our innovative transport solutions and advanced fleet management capabilities, allow us to deliver sustainable results to a diverse client base. Investing in people, managing risk. Manline drivers and workshop technicians are all highly trained specialists in their respective fields. Over and above their job skills, our staff are also trained to focus on safety, health, environment, risk and quality, helping us to deliver on our promise of service excellence. Our network is made up of 8 depots in key locations on major Southern African transport routes. All vehicles comply with - and even surpass - legislated safety standards. Fleets are continuously monitored via satellite for security and route-planning purposes. In addition, MAX, our in-house transport management system, provides real-time tracking information and customised notifications to our clients. Through our various product offerings, Manline moves a broad range of freight types, from general linehaul and abnormal loads to fuel, chemicals and other potentially hazardous cargo. The Manline Freight linehaul network extends across Southern Africa, servicing all provinces, cities and towns in South Africa and throughout the region. Our fleet of flat-deck superlinks, tautliners and drop-side trailers cater to a diverse range of industry sectors. Innovation is a major driver for us, and our creative solutions remain at the forefront of the transportation industry. The Manline Mega fleet transports abnormal, modular and project cargo with a load weight of up to 85 tonnes. For larger loads, up to 900 tonnes, and irregularly shaped cargo, a range of modular and multi-axle solutions are offered to cater to almost any shape or size. Our Hazchem fleet of drop-side vehicle combinations safely transports packed or drummed dangerous goods with payloads of up to 36 tonnes in South Africa and cross-border. The Manline Energy chemical fleet comprises tankers and flat-deck vehicles custom-configured to meet specific customer and product requirements. The fleet is run on a contractual basis. Manline Energy operates a fleet of fuel tankers throughout South Africa and into Zimbabwe and Zambia. 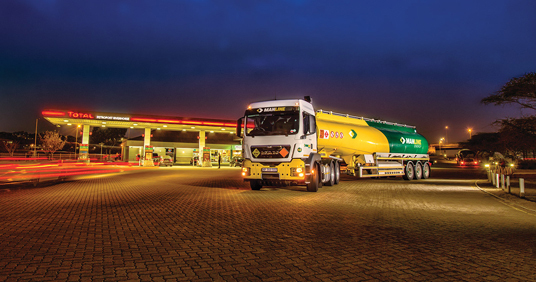 These vehicles are state-of-the-art multipurpose tanker combinations and can be tailored to all methods of fuel delivery, including metered pumps. Manline Energy’s LPG tanker fleet makes use of the latest technology in pressure vessel design. Payloads of up to 27 tonnes can be transported, making us a leader in the industry in this particular sector. High-speed delivery lines and discharge pumps guarantee improved operating efficiency. Manline founded by Neil Henderson with five trucks. Entered the general freight (superlink) market. Opened first in-house accredited MAN workshop. During 2000, expanded the long distance / tautliner fleet. Expanded warehousing and distribution throughout Kwa-Zulu Natal and Eastern Cape. 80 Trucks on the road with a growing customer base. M.A.X (logistics Mangement and Execution) . Real time internet based operating platform and database. Occupation of purpose built head office facility in Mkondeni, Pietermarizburg. Entered the black product market. Occupation of new Vanderbijlpark depot. Launch of new Manline Energy. New training centre opened at Head Office. Split of transport and warehousing operation in Johannesburg. First class of 20 Learners graduate and are employed by Manline. Five year vision to expand operations and grow the group brand throughout Southern Africa. Manline takes delivery of 86 MAN TGS WWW Truck Tractors for the Africa and Freight Divisions. Manline Africa opened a transit depot at the Beit Bridge border and a turnaround depot in the Zambia copper belt. Manline provides permanent employment for over 1000 people. Entered the bulk commodities market. Manline Freight has been in operation since 1998, and offers innovative general linehaul services tailored to meet the needs of specific business sectors. Service, safety and efficiency are our key drivers. Our drivers and technicians receive ongoing training, while our fleet is SQAS and RTMS certified. Manline Freight adopts an innovative approach to transportation, allowing us to load, transport and unload with maximum efficiency. Manline Energy has extensive experience and specialist knowledge in transporting hazardous cargo. Since 2006 we have been moving goods such as fuels, chemicals, gas and non-compatible bulk products across the length and breadth of South Africa, and into our neighbouring countries. Our fleet is 100% compliant with HSSE standards and carries CAIA and SQAS accreditation. 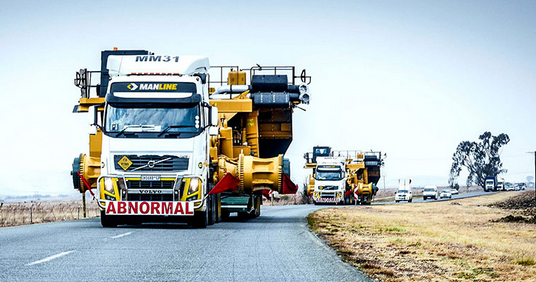 Manline Mega is one of South Africa’s foremost transporters of abnormal and project cargo up to 85 tonnes. Formed in 1995 (as TCS Logistics), Manline Mega’s state-of-the-art fleet and load-handling equipment gives us the flexibility to manage multi-faceted projects, including break bulk and general cargo, from beginning to end. Copyright © 2019 Manline Freight (Pty) Ltd.